Though seldom seen by people, mountain lions wander the countryside across much of western North America. The growing popularity of wildife cameras allows us to document these secretive animals in suburban parks, rural lands, and even forested patches adjoining our urban cores. Mountain lions occasionally reside in areas developed by humans, trying to eke out a living in the hidden habitats that remain. More often than not, however, they’re just passing through on their way to wilder places. 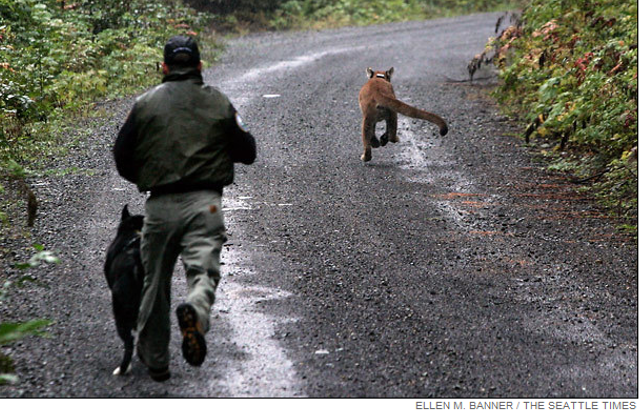 Can we coexist safely with mountain lions and continue to go about our own lives? The answer is a resounding Yes!—in fact, millions of us already do. Despite the close proximity of many people to such large, wild cats, conflicts between us are exceedingly rare. But coexisting with wildlife requires more than simply overlapping in space—especially as our world becomes increasingly crowded. To coexist peacefully with mountain lions now and into the future, we must educate ourselves about their behavior and learn how to be respectful and tolerant neighbors so that we and they can flourish. Public opinion polls suggest that most Americans treasure mountain lions and other large carnivores, and recognize the important role they play in nature. Beyond their intrinsic value, top-level (apex) predators help keep deer and other prey populations in-check—protecting our natural ecosystems from overgrazing and promoting ecological health. In short, coexisting with carnivores is a win-win for everyone. Sharing the land with wildlife is both an opportunity and a challenge. Below are 3 examples of how people are meeting this challenge with creativity and compassion. Today’s landscapes are dominated by humans, with roads and development dividing wildlife habitat into smaller and smaller fragments. Our wild neighbors rely on this landscape, too, for finding mates, raising families, and sustaining themselves with food and fresh water. Because mountain lions and other wide-ranging carnivores often travel many miles to meet their life needs, being able to safely traverse roads is critical to their survival. Tragically, millions of wild animals are struck by vehicles on our roads and highways every year as they attempt to move from place to place. The good news is that government agencies and non-profit organizations are working together to make roads safer for wildlife and people. In Florida, for example, wildlife underpasses have helped reduce collisions with critically endangered panthers, at least 24 of whom were killed by vehicles in 2017. On the other side of the country, the I-90 Snoqualmie Pass East Project will eventually include 20 new wildlife crossing structures to reconnect the Cascade Range—where mountain lions, wolves, black bears, wolverines, and myriad other wildlife roam free. Watch our webinar with Dr. Seth Riley to learn about how mountain lions navigate freeways and other intensive development in southern California’s Santa Monica Mountains. Inevitably, mountain lions, black bears, coyotes, and other carnivores occasionally cross paths with human settlements, where their search for food may bring them into close quarters with people. Wildlife agencies have traditionally dealt with human-wildlife conflicts using lethal force. Many communities are now taking proactive steps to protect both people and wild predators by preventing conflicts in their neighborhoods. For instance, we now know that we should never feed coyotes or other carnivores visiting our property, and that our beloved pets should be fed inside. The attentive management of trash and other attractants (e.g., bird seed, fallen fruit, compost) is also critical to keeping wild animals wild, wary—and alive. And carefully controlling our dogs precludes them from chasing or injuring wildlife, and also from getting themselves or us into trouble. Several wildlife agencies are also utilizing Karelian Bear Dogs (KBD) to help re-train bears and cougars to avoid humans through the use of these specialized dogs. The KBD program was established to resolve conflicts in a non-lethal manner. In other words, instead of killing wildlife they train the dogs to chase or haze bears and mountain lions which discourages the animals from returning to areas where for instance they have become accostom to food left by humans. The Washington Department of Fish and Wildlife (WDFW) estimates they have had an 80% success rate on black bears not returning to the conflict area. Check out our webinar with wildlife biologist Rich Beausoleil, Bear and Cougar Specialist, to learn about the success of the Karelian Bear Dog Program in Washington State. Ranchers and wild predators have been at odds in the U.S. since wildlands in the West were converted to grazing lands for sheep and cows beginning in the 1800s. Historically, millions of mountain lions, wolves, grizzly bears, and other large carnivores were eradicated by government-funded killing programs that reduced the distribution of these animals to a fraction of their native range. Although many thousands of carnivores are still destroyed each year due to real or perceived conflicts with agriculture, this story is slowly changing thanks to predator-friendly ranching practices old and new. Some ranchers integrate livestock guardian dogs with their flock or herd to keep predators away. Others use range riders and fladry (a type of flagging) to deter wild predators, and meticulously remove livestock carcasses from the premises so they don’t draw them in. If you choose to eat animal products, you can support ranchers who practice nonlethal conflict management by purchasing Predator Friendly-certified meat and dairy or buying directly from local farmers and ranchers whose values are in keeping with your own. To learn more about nonlethal management resources for ranchers, see Defenders of Wildlife’s Livestock and Wolves: A Guide to Nonlethal Tools and Methods to Reduce Conflicts. Watch the TV news coverage of the Karelian Bear Dogs in action! keeping your camp clean, and hanging food and garbage in double plastic bags at a distance from sleeping areas. There are a multitude of creative solutions that take a non-lethal approach to resolving human-wildlife conflicts. To learn about some of these programs, click on the links below.